I like to move this topic into the strength section. I hope to open some additional discussions on MOXY use in this huge potential field of practical applications from the individual athletes to a therapist to personal coaches and to team coaches looking for additional improvement in individual set up workouts . I like to show the start discussion, where we use SmO2 . The workout was a set of squatting exercises to individual subjective limitation followed by a set of sitting shoulder press loads. MOXY was attached on quadriceps vastus lateralis and on Delta pars acromialis. 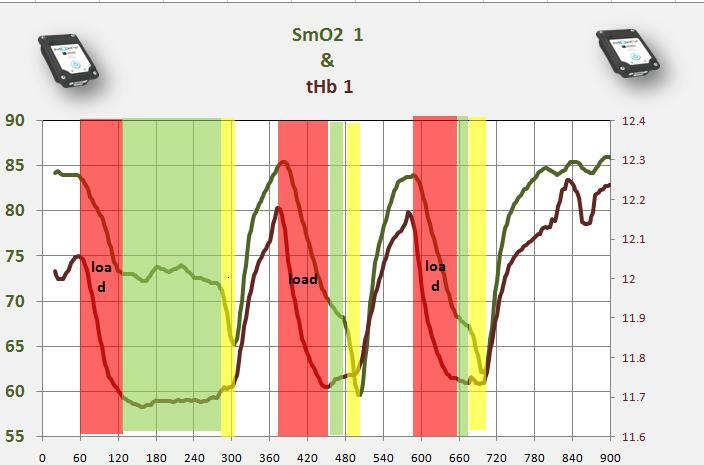 Dark green is SmO2 trend of the quadriceps muscle. 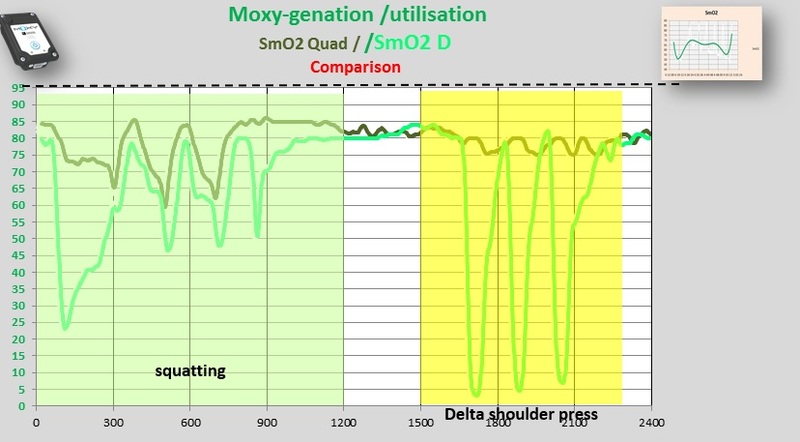 and light green is the trend of SmO2 from the delta muscle. What we like to show you is, that SmO2 is a great tool to see trends but if we look only on SmO2 than we do not have a clear picture on why we may see what we see and why we have to speculate on the reaction. Now again not a critic but an observation. Since we use NIRS regular in the research world since the late 1980 it is still surprising how many new studies come out , where we see that only SmO2 is used or HHb or O2Hb. What we miss in all this great papers is the combination of SmO2 as a part of the trend in tHb ( change in blood flow /Volume). The idea to leave tHb out of the discussion is great , when we look at studies, where blood flow is constant like during arterial occlusion studies or during resting situations. Once NIRS moved into the sport and activity field we can't ignore changes in blood flow and distributions and as such may have to rethink many ideas. Here a short part of that discussion from a great product and company. Now read carefully and you will find one section : tHb is assumed to stay constant ?? including the statement, that this may be not the case when we move ??? 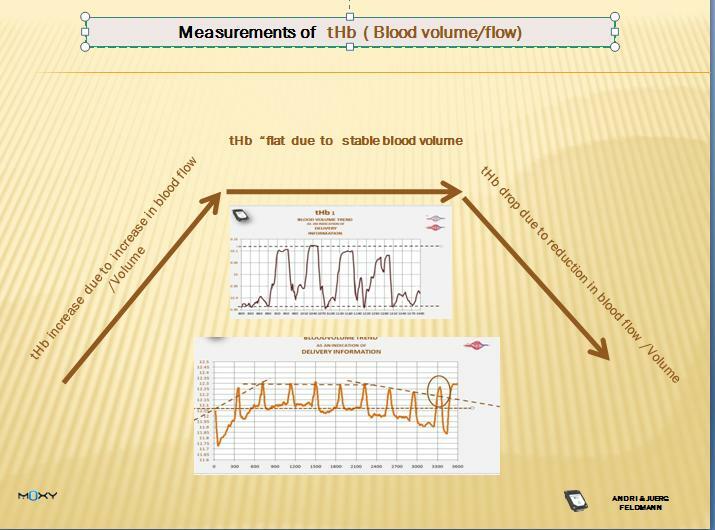 tHb has to be used under the idea, that during many activities the blood flow ( volume ) in the tested area most likely may change. 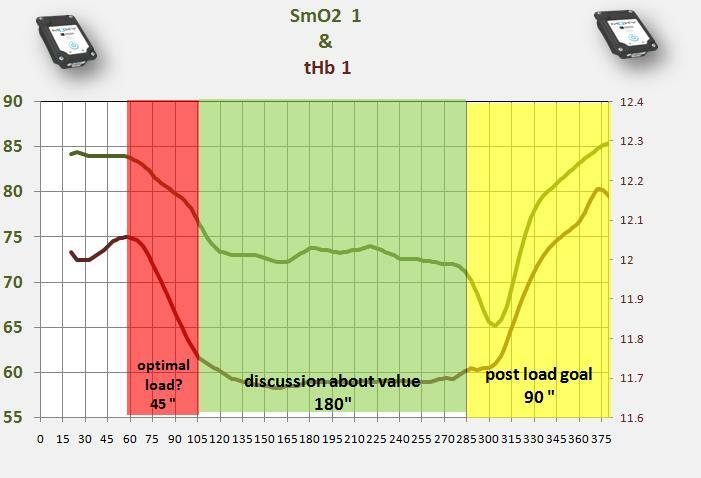 So a " stable SmO2 ( TSI % ) value as an indication of % O2 loaded of the tHb does not mean that we have a balanced O2 use as discussed in other sections in this forum. When reading an increasing flood of NIRS studies coming out be nearly daily we have e to keep in mind and critically look , whether they take this into the discussion or whether conclusions have to be critically reviewed.. Using a trend of HHb or O2 Hb alone with out considering tHb reactions can lead to some interesting results and conclusions !!!! So let's look first just SmO2 reactions. My thoughts: the torque necessary for making the 'shoulder' press movement pattern is much more dependent (isolated) on the deltoid muscle, compared to the squatting demands on the quadriceps. Plus the deltoid is comprised of smaller compartments, which creates greater demand to muscle ratio (tension) during the loading drills AND subsequently sharper de-load curve. With the deltoid, we're most likely to see more complete arteriole restrictions. So, just like you mention above, no way to shuttle in more O2 to satisfy demand. So in this instance, why would the governor bother ??? Squatting is opposite, the bar path and movement pattern are both great AND much less isolated, so a lesser restriction to inflow and greater 'systemic' ability for 'helpers' to shuttle in O2 from non-torque-generating compartments AND 'systems'. Re-load for quads is same for each set, so that's working, ensuring the start O2 load is not the issue. Increased 'system' readiness (supply & delivery) may explain less de-load on sets 2, 3 & 4. Or increased 'fatigue' may be the reason SmO2 performance is less? To be sure, I would need to watch the performances/technique of the sets, other bio metrics, and survey the post-drill RPE. Now let's add the information of tHb to the discussion. This is a closer look at the squatting. I added already three colors for further explanations. Red is the perfect load , green is still loaded and moving but ??? and yellow is actually no motion anymore at all. To show an additional feedback why we may drop SmO2 nearly to 0 on the delta and why not in the squatting read Fred's theoretical ideas and compare to the 2 graphs . look at tHb trends. So if strenght is a are you like to start integrating MOXY stay tuned here over the next few days. I assume most readers see the clear difference of this 2 all out loads and Fred explained it well, why we see in the delta a very low SmO2 situation compared with the quadriceps. Here once more the base picture. The actual load, so the time , where the athlete actually did optical squatting is red plus green zone. In other words. The red zone indicates a "perfect' squatting with the suggested sport specific knee angle. The goal was to push to subjective exhaustion in a perfect squat position. The goal, a perfect sport specific and therefor intermuscular great team work plus an optimal intramuscular overload was done in the red zone only. 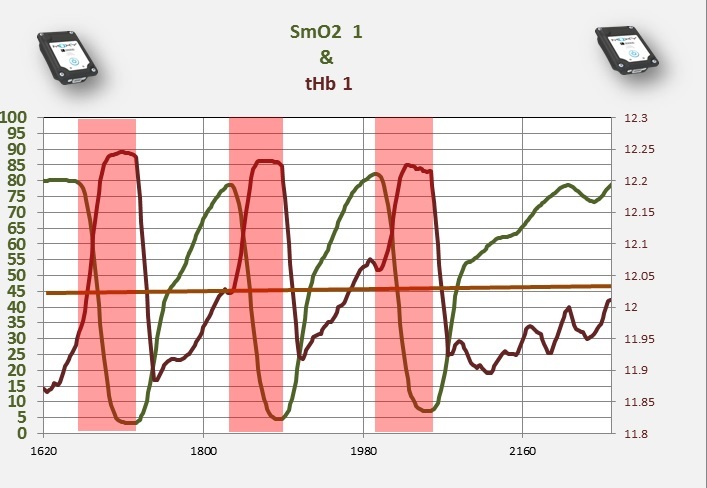 Describe for yourself the situation on blood flow based on this trend and why ? If you go back to Fred's explanation you can see what and why this is happening. So we actually, if we like to make here a perfect squat so hard for metabolic reasons, but perfect for sport specific reason in bio mechanic, we had a terrible workout in the first set and most likely would have little if perhaps even negative benefit from this workout towards the target idea of the motion. If we give a time or a repetition number in any strength workout than this is often the end result. So the athlete should look optically in front, when he looses the target muscle and when he starts to compensate to just survive the "ordered" cook book load time or cook book target reps . Same with the rest period which in this case was guided by SmO2 recovery back to base line. Now interesting is the yellow zone. You can see without any problem, that despite the end of the load at green the SmO2 really drops extreme and this is even more extreme, when you look that tHb actually is increasing. What may be the reason of this extreme situation. ? Workouts like the above , for sure first set , are one of the main reasons we see so often athletes in the therapy and rehab. This forced bad reps create in many cases a muscular dysbalance and a muscular dysharmonie. 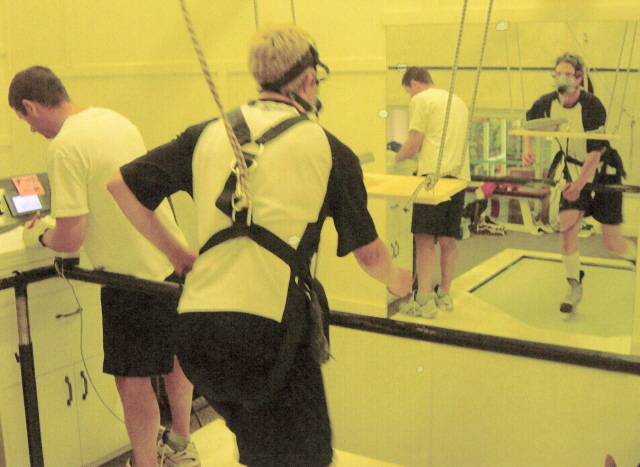 Initial high quality movement PLUS forced reps create a metabolic situation the subjects VE could not balance and initial delivery to reload is reduced until that situation is OK.
As you said, probably a great subjective effort, but after the SmO2 de-load levels off, it may result in not much more than athlete hanging in there, huffing & puffing. 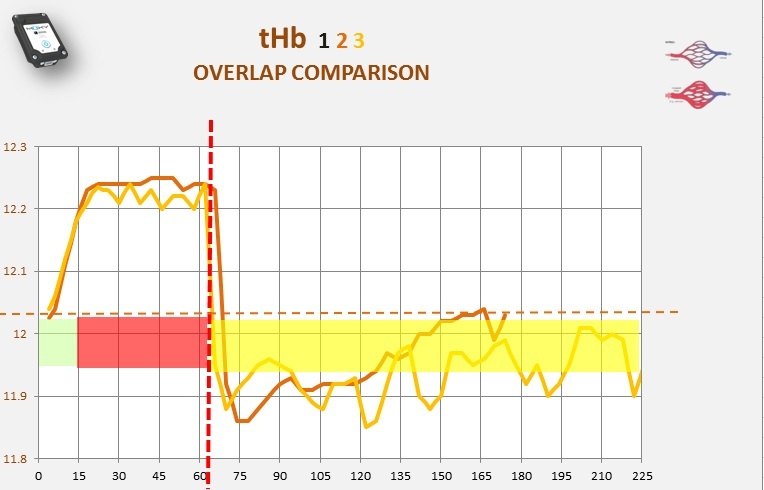 If the goal is maximum strength adaptation (client is stronger next session), I stop the loading when the tHb has gone in the desired direction and the lifter cannot persist to maintain the SmO2 de-load peak. As a result I literally haven't coached a # of reps or sets in almost a year. I have a question with the athlete not being able to get the SmO2 de-load peak. Is there any rule that you apply. Like if the base seems 70 and if de-load doesn't go back to 70, it's over? It of course also has to do with the specific goal I guess. Other question. Is there anything to say about cardiac output in this case? Or wasn't that measured? Will be back after work on both of this great feed backs. Just to set my confusion straight. Ruud talks about deload but is it that you may thing about re load . Fred I think is really talking about de loading meaning if he can see that the nice downwards trend in SmO2 or the upward trend in tHb start to " studder " hm is that an English word ?? but may be you understand what I mean. Yup, I apply the practice you mention to re-load & de-load. I keep the sets going until I see a change in either that is related to performance quality. RE: cardiac output, I may defer for more expert ideas from folks who are using the Physioflow, however my sense is that cardiac output contribution during strength performance will be load sensitive, i.e., lighter loading = greater delivery X heavier loading = lesser delivery due to effects of compression tensions. OK thanks Fred for your response. I asked the question about cardiac output wrt (possible?) interactions that might exist with using a certain weight - repetitions - time (constant or based on load/deload) between sets (and between reps) and stimulation of either HR or SV. Just based on some anecdote ("feeling") that I have when doing squatts 15 reps (at 60% 1 rep max) as soon as I stop, my heart start to pound hard (you feel the pounding in the chest). Maybe it's only subjective because when you're busy you don't notice it. 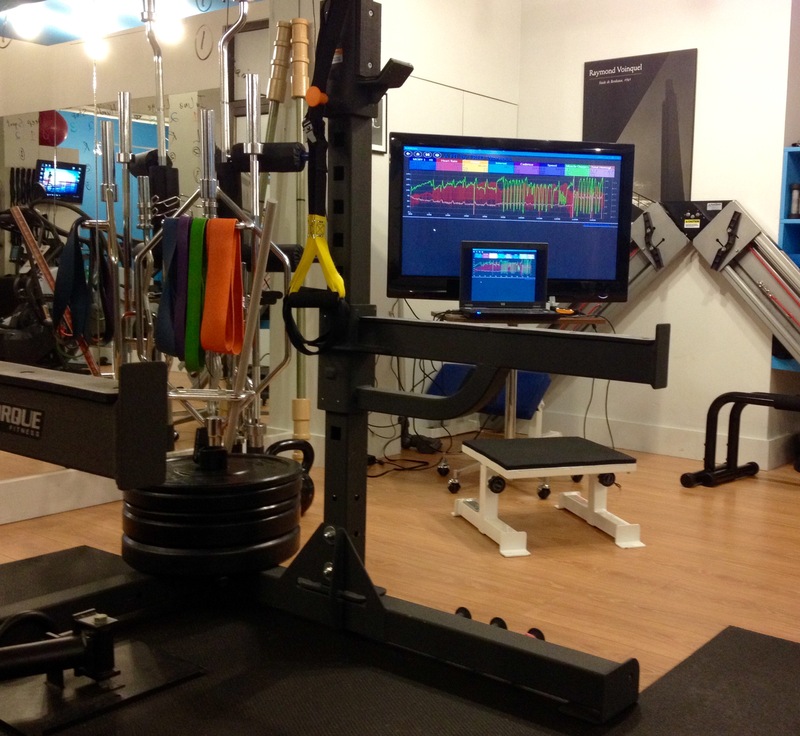 I will start to use the Moxy with strenght training as well to share things so it does not stay subjective. Depending on the overall conditioning situation, I 'think" at the load you mention (65% X 15 Reps), a CO responding at end of set will be 'normal'. Look at the example above that we started with, note the duration of the sets (probably a gruelling experiment) and we see the tHb X SmO2 reactions from loaded to unloaded sets. From this, especially set 1, we can possibly guess who compensated in and not so easily in set 2-3. And which limiter came on heavily at end of each set to regain the last metabolic balance. Thoughts? We will be on here for many more weeks to come as there is a wealth of information I like to share. So great start into the discussion. Let's see how we start and or sort this here. 1. Feedback to Freds great summary . 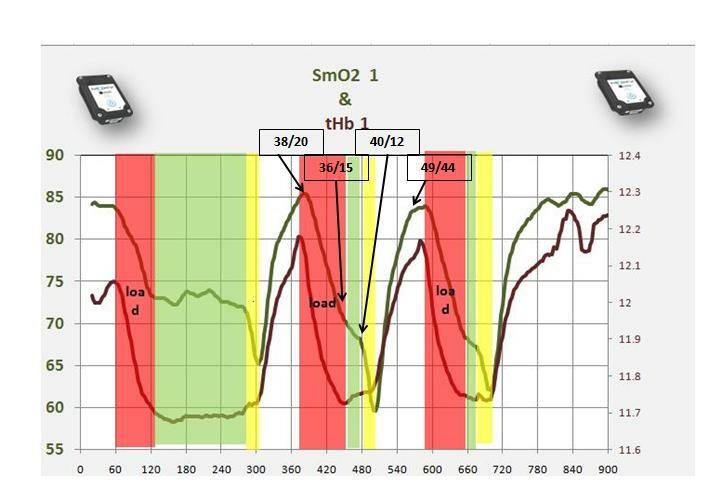 What causes the drop in SmO2 after the fact and after we stopped actually " demanding " O2 for the work or performance. Is this a kind of an EPOC ?? or is it rather a need less fro refueling ( what epoc would be. If we have such a thing like EPOC than we would expect , that the VO2 is higher after a load ( which is the case ) and if we would be in a O2 deficit we would have a lower SmO2 . Which is the case of a few seconds and than we may even have the opposite , an overshoot of SmO2. EPOC got introduced when researcher started to see, that the old idea of O2 deficit can't be really explained by any means and that this idea most likely got created due to the lag time of testing equipment rather than actual physiological reality. Juts to close this thought a picture you can think through what it may mean or should show. So I think like Fred points out ,this is a nice example of a drop in SmO2 to compensate for the lack of possible delivery. The load ( red zone) plus the additional load ( or perhaps not optimal load,) green zone created a huge H + production and as such a huge CO2 pool , and the body was not able during the load and for a short moment after the load to get rid of it. As the load stopped , there was an immediate attempt to refuel CP and ATP as they may have drop down to the critical low level and it needs O2 to refuel O2 independent energy sources. CP could be used to get a P to refuel ADP to ATP ? As such nothing is really O2 independent as O2 independent is very dependent on O2. We know that the SmO2 trend runs very similar to the CrP trend, so you can see, what really may happened with a very simple tool MOXY. Below some additional bio markers we used and it will explain you a lot. First number in the square is EtCO2 tested with a capno meter ( Emma) second number is RF ( respiratory frequency )tested with a BIO harness. Limitation. 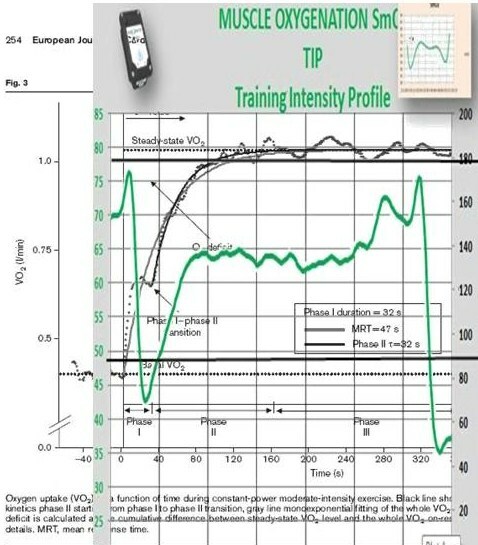 The EtCO2 is NOT equal the Pa or PA CO2 and it has a lag time reactions as well it depends on the respiratory ability and level of an athlete. How is he reacting. A great respiratory trained system will react over a high RF but as well a higher TV. A not optimal trained or untrained athlete will react mainly over high RF but lower TV. As such it will take much much longer to re balance H + homeostasis and as such much longer time needed to refuel O2 independent energy sources. So the real deal is to test this with blood sampling ,but again it has a lag time . Nevertheless we had the great opportunity to do this with Per Lundstrom in Santa Monica red bull head quarter. Here just a very short inside view in a similar idea of squatting and the reactions in numbers for the critical reader. So this is NOT a cook book and is true only in this case study. What are the practical applications in different sports. a) fix the MOXY on the main contributor of a sport specific motion. Example 400 M track athlete. Moxy on hip extensor. ???. Now you plan an interval workout. Classical idea. perhaps 5 x 400 m with 3 min rest. Or 100 / 200 / 300 / 400 / 500/ 400/ and so on. Any thing which sounds brutal and is brutal is used. Every thing creates a metabolic acidosis and as such an incredible demand on Ca ++ use . It is used to train lactate tolerance ???? It is often a planned idea to create a stress fracture due to this. We could replace this enzymatic goal by using a respiratory acidosis instead ??? so no Ca ++ used in this huge amount . Secondly the risk is increase, as all the athletes will completely kill the main muscle performer ( hip extensor) and as the goal seem to be finish 5 x 400 m , and not finish a perfect load on the perfect muscle chain and avoid compensatory bad motions we actually overload not just the main muscle but change bio mechanic with many wrong loads on tendons and joints ??
. Here an alternative option . Let's stay with our example, but it can be used ( cook book option ) in any interval or strength workout. Optimal perfect load for vastus lateralis in a squat motion was app 45 " ( red zone ). The athlete kept going , but simply used different options to keep the squatting going . 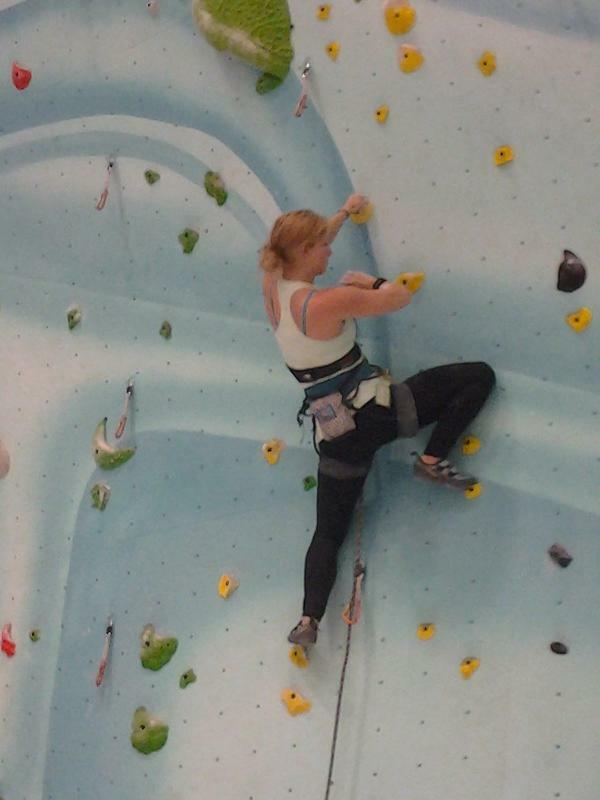 Less bending in the knees, more motion in the hip and so on. So in a 4 00 m training you do NOT use 400 m as the goal, but you use the optimal load time for what you like to load and where you like to increase the time . So you have 1 or 2 MOXY's on the athlete . You see live on your computer the action. You start what ever the start speed is you like to use or go all out and see, when the optimal motion is over from an energy point of view and as such as well from a bio mechanical point of view. You see it , the athlete can feel it and you stop the load when you see the SmO2 reaction and the tHb reaction. This may be by 267 m , who cares. Your stop . How long.? To re bounce to start SmO2 or to wait till we have an over shut and as soon we have the highest point of over shoot ( possible the highest load in CrP we go again. This may be after 1 min 56 seconds. New load 299 m. Intermediate time by 100 and 200 or what ever can show , whether you maintain the speed or whether you are even faster or much slower. tHb will tell you the same. New rest wait for overshoot 2min 36 seconds . And you keep going. You stop, when times are slower over the same distance or when you can reload any more, or when you do not reach the same quality contractions anymore. So here to end. Destruction of quality contraction in the shoulder press motion shown by tHb. When we use MOXY in strength workouts, which is super easy as you mount the MOXY on the target muscle and if you like one on a very little and or non involved muscle and you go. The client can see live on the big screen , what is going on. If I have 2 or more patients working out, I use a big screen so all 4 can see on the screen what they do and they are super motivated as they can see that despite working in a group, it is all about being individual. I can have a high school student working on his ACL recovery and a 78 year old client working on his TKR recovery(total knee replacement ) They work shoulder on shoulder, have a great interaction and can actually help each other to stay motivated and work on their individual ability to improve. I can guide a workout on the ice or on the snow or where ever and can give immediate feedback to the athlete, so we have video, feeling of the athlete and physiological feedback as we never had before. For any top coaches we approach one by one it is anon brain er, once they see that and they immediately understand how they dramatically can improve their results and the quality of their services. Here a top chef from the eats coast. a regular reader and great feedback guy . Fred from Halifax. A rare, but great view into a top notch fitness center for the average person of the street, They get a better service and higher individual feedback than many multi million $ payed pro athletes. It is all one by one no matter on the status, it is all for personal best and health. Now here what you look for as a "cook book"
1. 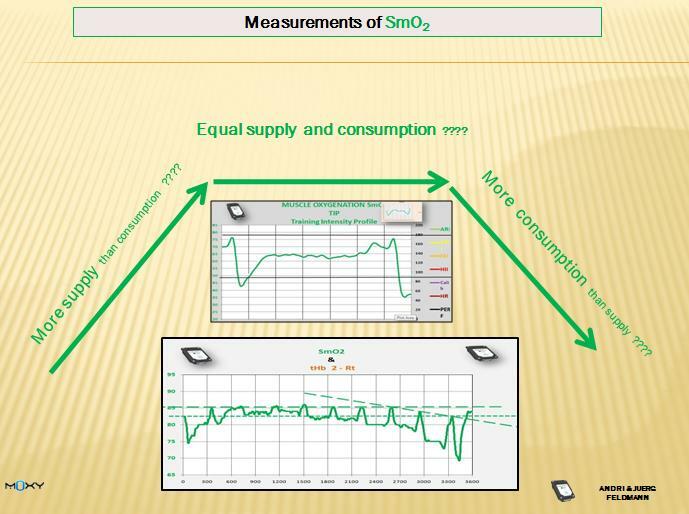 SmO2 trend as a feedback on utilization of energy. Now SmO2 is not just but nicely used for utilization feedback, but it is strongly related to delivery feedback. The tool or marker for delivery feedback is tHb. What a great thread! Thanks J and Fred! Question re; comment in #10 on how the acidosis created through excessive or exercise intensity can cause a metabolic imbalance balanced by Ca++ - thus impacting bone health? J, your comments "...train lactate tolerance ???? .... planned idea to create a stress fracture... We could replace this enzymatic goal by using a respiratory acidosis instead ??? so no Ca ++ used in this huge amount . So am wondering just how we might use this insight to address clients' with shin splints or prevent this (annoying) over training injury with those at risk? I like to give an answer written by much smarter people as overall look at his injuries. more than 20 miles per week . risk factors of an individual athlete . I wanted to add a few points to this thread, as it is very active. Just based on some anecdote ("feeling") that I have when doing squatts 15 reps (at 60% 1 rep max) as soon as I stop, my heart start to pound hard (you feel the pounding in the chest). Maybe it's only subjective because when you're busy you don't notice it. Nicely presented by Fred's images, and we have all seen seen the effect of occlusions in tHb with the Moxy, when we do strength training we often have a limited return of blood to the heard for a short moment due to poor circulation from muscle pressure. Once this muscle pressure is released, we have a sudden rush of blood back to the heart, and with it many biomarkers communicating what is going on in the muscles. Firstly this rush of blood back to the heart will increase preload and cardiac output, and the peripheral feedback will relay a demand for increased energy substrates, and the elimination of metabolites. This would all very logically explain the high central demand post strength bouts. Secondly, we have been working with some elite strength trainers in Switzerland who are very interested and the application of Moxy during strength training. How and where can we use it, something to discuss. At the moment (this could all change based on your persuasive arguments ), I see SmO2 as a bioenergetic signal, and therefore useful for longer duration sets of multiple reps, or longer time frame (5s-10s+). Of course, as we all see oxygen is used immediately for energy production, so it is not that we dont need oxygen for shorter maximum bouts, that is not my point just to be clear. The question is, during a 1 or 2 rep maximum effort, is our performance limited by bioenergetics? I would argue it is limited by CNS, motor-muscle control/coordination, and muscle contraction potential. Therefore for max strength/power I dont see SmO2 as a control of intensity to be super useful. Recovery is again a different story and using SmO2 overshoot in my experience has worked nicely. THB on the other hand does give use some indication of muscular force being produced, but again for max strength I would suggested that the usefulness may be limited. Thoughts? For hypertrophy based or "endurance based" resistance training, I think Moxy is an excellent tool to gauge much like Fred describes both intensity and recovery. Not only that you can now decide if you want the intensity to last in a mostly oxygen dependent zone, or push on to maximize oxygen independent production. Here a suggestion to all discussing MOXY and maximal strength. Make some workouts and combine SEMG and MOXY and sent the info back in. Try to combine theory and real practical feed backs . So the challenge is out there. 1 or 2 rep max contraction combined with MOXY and SEMG on the same muscle under the same tape.